In this tutorial, we’ll show you how to use Twilio’s Programmable SMS to send SMS and MMS messages from your Python application. While you can send text-only SMS messages almost anywhere on the planet, sending media is currently only available in the US and Canada. Learn more in this support article. The code samples in this tutorial use Twilio’s Python helper library. Let’s get started! If you have a Twilio account and Twilio phone number with SMS capabilities, you’re all set! Feel free to jump straight to the code. Before you can receive phone calls and send messages, you’ll need to sign up for a Twilio account and purchase a Twilio phone number. If you’re brand new to Twilio, you can sign up for a free trial account to get started. Once you've signed up, head over to your Console and grab your Account SID and your Auth Token. You will need those values for the code samples below. Find a number you like and click "Buy" to add it to your account. If you’re using a trial account, you will need to verify your personal phone number via the console so that you can test sending SMSes to yourself. Learn more about how to work with your free trial account. Now that you have a Twilio phone number you can start sending messages to mobile devices. 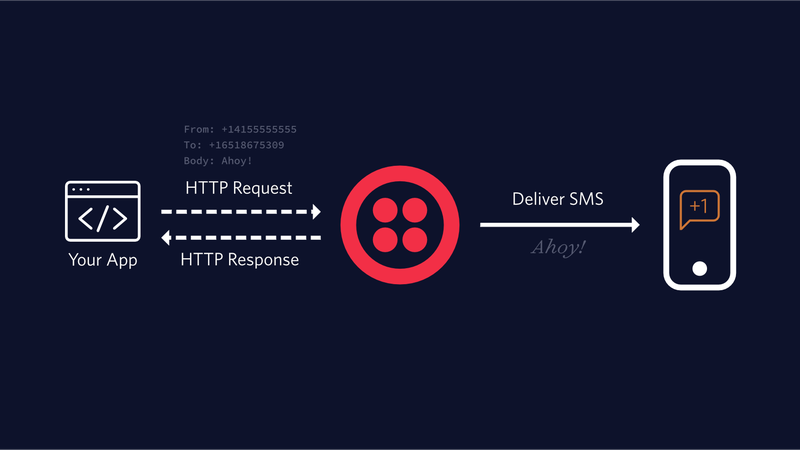 To send an outgoing SMS message from your Twilio account you’ll need to make an HTTP POST to Twilio's Message resource. Twilio's Python library helps you to create a new instance of the Message resource, specifying the To, From, and Body parameters of your message. If you’re not using pip you can find manual installation instructions here. Replace the placeholder values for account_sid and auth_token with your unique values. You can find these in your Twilio console. You’ll tell Twilio which phone number to use to send this message by replacing the from_ number with the Twilio phone number you purchased earlier. We also include the body parameter, which contains the content of the SMS we’re going to send. In just a few moments you should receive an SMS! If you’re using a trial account, you'll notice that any messages you send will always begin with “Sent from a Twilio trial account.” Once you upgrade your account, you will no longer see this message. Learn more about sending SMS and MMS messages from a trial account. Let’s take a moment to understand what’s going on behind the scenes when you send this request to Twilio. When Twilio receives your request to send an SMS via the REST API, it will check that you’ve included a valid Twilio phone number in the from_ field. Twilio will then either queue the SMS or return this HTTP error in its response to your request. Assuming your request didn't result in any errors, Twilio's HTTP response will include the SID of the new message. This unique identifier will help us reference this message later: in the code above, we printed that SID to the terminal. You can access any of these attributes from your Python code, much like we did when we printed the message.sid. Try adding a print statement like print(message.status). Save the file, then run the code with python send_sms.py one more time. You should see the status of your message, "queued", printed to your terminal. If you receive an error in response from Twilio or never receive the message, you may want to check out these tips for troubleshooting undelivered messages. If you’d like to track the status of your messages in real-time, you’ll need to set up a StatusCallback URL. Learn more in our tutorial on confirming message delivery in Python. This will create a new Message instance for each phone number in the list. As you send more messages via the API, Twilio will queue them up for delivery at your prescribed rate limit. API requests for messages that exceed the specified rates will be queued and executed as capacity is available. If you need to enqueue a large volume of messages, you may find that it's helpful to leverage Twilio's Messaging Services. See our guide on how to set up and send messages from a messaging service in your language of choice for more tips. While you can send text-only SMS messages almost anywhere on the planet, sending media is currently only available in the US and Canada. To include media in your Twilio-powered text message, you need to make an addition to the code we wrote above. This time, we need to add the media_url parameter. Again, update the from_ and to parameters to use your Twilio phone number and your mobile phone. The new media_url parameter in this code tells Twilio where to go to get the media we want to include. This must be a publicly accessible URL: Twilio will not be able to reach any URLs that are hidden or that require authentication. When the Twilio REST API creates your new Message resource, it will save the image found at the specified media_url as a Media resource. Once created, you can access this resource at any time via the API. In just a moment you should receive a text message with an image! You've now successfully sent some messages with the Twilio Programmable SMS API and the Python helper library. Learn how to send an SMS during an in-progress call with Python and Flask. Monitor the status of your message to confirm its delivery. Learn how to reply to an SMS sent to your Twilio phone number. Learn how to manage message state to turn individual messages into a true SMS conversation. Dig into the details with our API reference documentation for Messages. Sending high-volume messages? Check out our messaging services.